Is it possible to improve a masterpiece of the nautical art, a yacht that, in two years, has won over both critics and the market? The answer is a crystal clear affirmative, carried on the still-warm summertime wind of Cannes, which from 12 to 17 September will caress the new, magnificent version of the Ferretti Yachts 550. The restyling was, in a sense, a simple enough task, considering it was based on a concept that was already so admired. For this reason Ferretti Group chose to accentuate those innovative elements, introduced two years ago, which had already achieved such incredible success. Therefore, the main deck’s uninterrupted glazing once more ‘cuts’ the yacht’s profile, emphasising its dynamic look. Then there are the three large glazed windows on the hull sides, with flush portholes – the cabin windows – that perfectly complement the overall design and grant magnificent views from the interiors, as well as plenty of natural light. It is in the design of the interiors, however, that the restyling took an original and surprising approach, which can be seen in the extremely refined choice of furnishings, made possible thanks to partnerships with the most prestigious luxury brands, offering the most sophisticated expressions of “Made in Italy” quality. 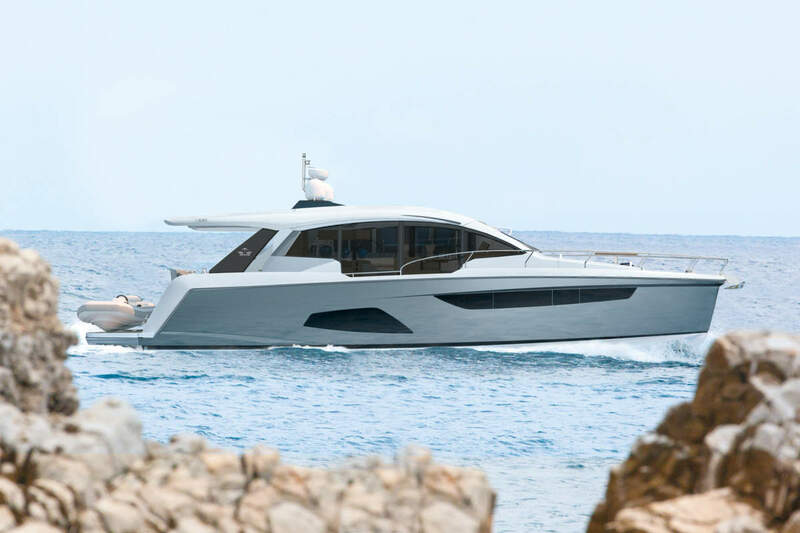 The new Ferretti Yachts 550 is, as always, the brilliant outcome of cooperation between the Ferretti Group’s Project Strategy Committee and Engineering Department and the Studio Zuccon International Project. The yacht combines elegance with a sporty character, enhanced by sophisticated style choices. The dominant type of wood, throughout the entire vessel, is flamed walnut from the Piero Lissoni Collection by ALPI. It has been combined with opaque, greyish-beige and quartz-coloured lacquered surfaces and a light-coloured fabric that not only provides the character for the sofas and the surfaces of the furnishings, but has also been used to upholster the ceiling panel of the main deck. The result is a space that feels even more like a home, furnished with all those details that make it feel “familiar” to its owner, who has the feeling he is sailing in a floating suite. Access is via the aft swimming platform, thanks to several steps integrated in the hull’s starboard, to which an electrical-hydraulic gangway leading directly to the cockpit may also be added. The aft swimming platform features a tender lift with a slide that extends for over one metre, allowing a tender of up to 3.25 metres in length to be easily and safely launched and hauled in. When the tender lift is operated, it reveals some steps in the hull that make it possible to go into or come out of the water extremely easily. Aft, the cockpit is furnished with a central sofa, to the port side of which is a large underdeck locker that can alternately be converted into a sailor’s cabin, and a low cabinet to forward starboard where the icemaker can be installed. In addition to the glazed window, the large open space is equipped with a galley to starboard, furnished with a custom-made L-shaped worktop in quartz resin, with the pantry to the port side. Further on, we find a C-shaped sofa and a dining table to starboard, as well as another sofa facing it on the port side. Beyond this, the pilot station can be found. The décor of the lower deck, reflecting the greatest possible care for details, is the same found on the main deck. The ceiling panel, however, is upholstered in ivory fabric. The layout includes three guest cabins and two heads. The full-beam master stateroom is preceded by an entrance room fitted with a storage cabinet and, upon request, a second washing machine/tumble dryer. The central double bed, characterised by a band and headboard in sand-coloured Novabuk fabric, stands beside a low cabinet, to starboard, which runs along the entire glazing. To port side is a dinette with two facing seats and a square table. The owner’s head provides the benefit of a second full-height glazed surface that lets light shine through to brighten the shower box, which is separated from the toilet by a glass wall. The shower top and bench are lacquered grey-beige, as are the window frames and the vertical cabinets. The washbasin is supplied by Flaminia Pass and the taps by Treemme Xero. The VIP cabin at the foredeck, just like the twin guest cabin, features a décor similar to that of the master stateroom. It has two wardrobes and a vanity set with a pouffe, which in the layout with three heads can be replaced by a private bathroom with shower. The new version of this 55-footer offers owner and guests two large outdoor relaxation areas, in addition to the cockpit. The flybridge is dominated by a large dinette area with a C-shaped sofa surrounding the extendible table. To make the most of on-board space, the life rafts have been stored under the aft seats. The section of backrest facing the pilot station can be tilted to convert the part of the sofa facing in cruising direction into a double seat for captain and co-pilot. The forward lounge is fitted with facing sofas and, upon request, a retractable extendible table, which is stored in the body of the sofa facing in cruising direction and can be folded out to dine in the utmost privacy. A large sunbathing area is located on the foredeck, fitted with a double-edged sunpad that also serves as a backrest for the dinette aft seat. The yacht is equipped with a pair of MAN i6-730 CR engines, having a power of 735 MHP at 2,300 RPM. These engines can push the vessel to a maximum speed of 30 knots and a cruising speed of 25 knots, with a range of 280 and 310 nautical miles, respectively (preliminary data). A bow thruster is installed standard on the Ferretti Yachts 550, while a gyroscope stabilizing system can be installed upon request to ensure even more comfort at anchor and facilitate berthing manoeuvres. The 550 is seen by many as a boat of the year contender for its class size and its easy to see why, packed with everything a discerning owner would need to throw wild weekend parties, or simply, up anchor and cruise off into the sunset for a relaxing weekend, the 550 has it all.